Once christened the International House of Pancakes, a change of branding and marketing in the early part of this decade revitalized the struggling restaurant chain and brought with it one of the most surprising turnarounds the restaurant industry has ever seen. Gone are the various flags etched into the partitions between booths, the stoic serif font of the logotype. Replaced with a more cozy and modern interior look and a bulbous sans-serfif font: IHOP. One could almost forget what it originally stood for, though I won't. The famous blue roof is an icon; a lighthouse to the road-weary traveller looking for a place to eat where there's a carpet, soft lighting and a predictable atmosphere. And then there is Denny's. A rancid red-on-yellow sign points the way, almost as if to say, "Look. You're not going to do better." The food at Denny's is mediocre, there's no doubt of that. It's something intangible though, a feeling I get more than any objective "score". The food is simply substance, necessary to go on living (though not a particularly pleasant life for a few hours afterwards), whereas at IHOP, the food is a meal to be shared and experienced. When we were in high school, the localest Denny's for a time hosted most of our little get-togethers, being one of the few 24-hour places around. Which gave rise to our own personal slogan of "You don't go to Denny's. You end up there." And it's true. I've never left my house in an earnest attempt to find a Denny's and eat there. It's simply a product of elimination. What's open near where we are? And trust me. NEVER order the Moons Over My-Hammy. At the risk of being typecast as some sort of vintage Macintosh nut, I couldn't help but find myself agog at the following piece of retro mac heaven (especially considering my previous loving tribute to the Mac SE/30). With the right fabrication skills, you could have a carbon fiber mac. Now THAT'd be badass. Well, far be it for me to re-tread on ground covered by Pseudonym so recently, but I have an altogether different take on the Kindle phenomenon. I was an enthusiastic Kindle 1 user, getting mine several months before the Kindle 2 was announced. I thought I had finally found ebook nirvana. But I have since become a disillusioned and rather frustrated Kindle owner. You see, over the years, I've dabbled with a truly ridiculous number of ebook reader-analogues, trying to find the ideal mix of convenience, portability and readability. 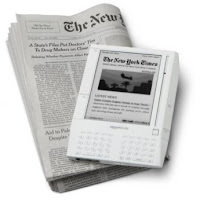 My favorite devices, before the Kindle, was a Newton 2000, or a Sony Clie NX70. Both of them were small, had terribly long battery life, and had easy-to-use interfaces in either landscape or portrait mode. But they were imperfect. The two major shortcomings were the readability of the screens (low-contrast for the Newton, low-contrast and overbright for the Clie), and the lack of easy access to legitimate content. I very quickly grew tired of Project Gutenberg public-domain etexts and promotional ebooks. I wanted all of the books that I could buy at my local bookstore, in ebook form, and I didn't want to have to delve into the morally, legally, and ethically dubious world of ebook piracy just to get books I'd be more than happy to pay a fair price for. Fair price. That's the rub. The Kindle, at first, seemed like an ideal product: it solved all of the readability problems of other devices with its gorgeous eInk screen, and it finally made available a huge catalog of in-print books for fair prices. Let's be clear, here: ebooks are not physical books. They are un-resellable, they are limited to use by an eventually-obsolete device, and they are hampered with DRM. I don't mind any of that, as long as the price is commensurate. So, when the Kindle store was first introduced, the prices were a breath of fresh air: finally some reality in ebook pricing. In-print hardbacks were never more than $10.00. Paperbacks were deeply discounted from list price (30 to 60 percent or so). But since I've bought my Kindle, I've been dismayed to see the price rise steadily. Current hardbacks probably average $16 to $21 dollars, often more than the price Amazon sells the physical copy for. Paperbacks, the majority of books I'm interested in buying, have seen an even more extreme and nonsensical increase in price: the Kindle price is almost always more than the physical list price. Let me repeat that: MORE than the list price. I don't know who to blame. Equally vociferous commenters blame greedy book publishers or Amazon's unrealistic profit-sharing. I don't give a damn. Until Kindle ebook prices come down, way down, there is no way in hell I'm going to buy another Kindle. No matter how big the screen is. But they still face prejudice, based almost entirely on where they live or their ancestors lived. Moving is little help, because employers or parents of potential spouses can hire agencies to check for buraku ancestry through Japan's elaborate family records, which can span back over a hundred years. Emphasis mine. I won't pretend to know a lot about Japanese culture, but I was fascinated by this holdover from a rigidly-enforced caste system that I never knew existed in Japanese history. Reading more about cultural issues in modern-day Japan, I also learned that Japan, like the United States, has its own tortured past with indiginous peoples: the Ainu and the Ryukyuans. Come ON! Now I KNOW you're doing this on purpose. 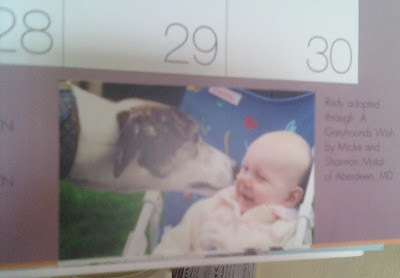 Eldritch: Weaselsnake: the internet's premier source of traumatizing greyhound photography. Pseudonym:Well, that baby ain't laughin'!. "Is that an Mp5? IT IS! Now I can solve up to 800 problems a minute!" 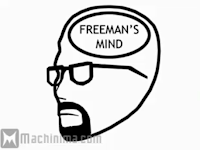 Many of you may know of Gordon Freeman, the silent protagonist of Half-Life. But what's he thinking when he's escaping the Black Mesa research facility? Pretty much the same thing as you, as it turns out. Unlike most people who play video games these days, I cut my teeth on early Macintosh games. 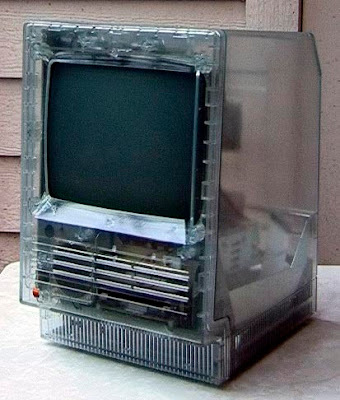 Growing up, our first real computer we had around the house was a Mac SE (well, the real first one was a Trash 80, but that's a whole different story). Though it was a tiny market, early Macs had a surprising amount of quality game software. One of my favorites was the MacVenture series of point-and-click adventure games. First released in 1985, the four MacVenture games can lay claim to being the very first point-and-click adventure games. Taking advantage of the high-resolution graphics and the standard Mac window interface, the MacVenture games let a player simply drag items from the first-person screen int the inventory, or onto another item. The writing was top-notch, frequently witty, and in many of the games, downright unsettling. While the series began with Deja Vu, my fondest memories of the MacVenture series was Uninvited, an atmospheric haunted house story, where the protagonist awakes to a crashed car and a missing little brother, and must venture into a creepy old mansion to rescue him. While the games were made for the Mac originally, their popularity led to them being ported to other systems. The DOS and Amiga versions made the transition relatively unscathed, but the NES ports were savagely cut down, with huge portions of the gameworld excised, gameplay simplified, and most horrifyingly, most of the text was gutted and replaced with simple, short, declarative sentences. Unfortunately, the popularity of the NES compared to early-era Macs has meant that most of the people who know of Deja Vu, Uninvited, or Shadowgate, are only familiar with the simplified, zombie versions released for the NES. 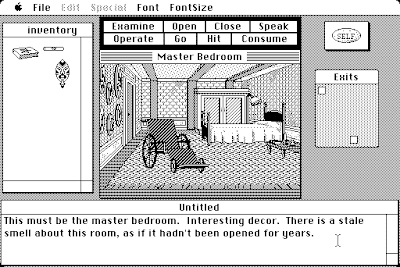 So if you're hungering for a nostalgic trip to the early days of adventure gaming, grab an early Mac emulator for current-vintage Macs, or for other operating systems, including Windows and Linux, and dig up a copy of Uninvited (or Deja Vu or Shadowgate), and revel in the joys of really old-school adventure gaming.